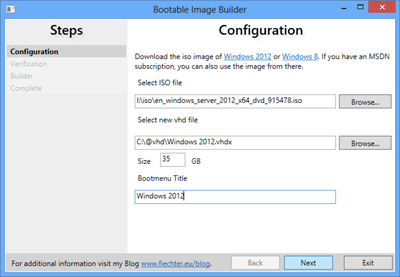 The bootable image creator, allows you to create an additional Windows 7, Windows 8 or Windows 2012 installation in a virtual disk (vhd). It configures a separate boot entry for your system and allows you to run an isolated test or development environment on your system without hyper-v. That should give you a better performance. The tool is automating all the necessary steps to build and install this. This tool is not for creating images, which can be used with Hyper-V.
Why did I made this tool? To configure a multi-boot environment with a VHD is a straight forward process and well documented on the internet. Unfortunately you need a large set of tools to achieve this (diskpart, bcdedit, disk manager, imagex). After searching all the tools multiple times, I decided to automate all the steps and put it together into a small application, where you don’t have to download anything else except the .iso file with the operating system. Download a Windows Iso image, extract the install.wim file and use imagex to apply it to the vhd. (You can do it also by burning it on the disk and afterwards do the installation to the vhd). Finally enter the title for the boot menu entry (This entry will be shown at the beginning before Windows get loaded). After the first boot, the Windows VM can have one blue screen due to hardwarde detection. Just start it again two times and it will work.